I woke one bright Saturday morning, blinking the sleep from my eyes. I rose and shuffled into the kitchen, blearily dumping coffee grounds into my French press. I turned on the kettle, and trundled to the bathroom to take my morning medication. I wandered back to the kitchen, and poured the hot water into my press, inhaling the pungent scent of brewing coffee. I leaned against the counter, waiting for my coffee to steep, and a peculiar feeling flooded through me. I had the distinct impression that something was missing. I did a quick scan of the kitchen. Everything seemed to be in its place. I walked through the bedrooms, checked my wallet and my keys – nothing was missing. I couldn’t pinpoint my inexplicable apprehension – I just knew something was off. I returned to the kitchen and reached up to the shelf to retrieve my coffee mug and there it was…or I should say, there it wasn’t….the stiffness that normally engulfed my joints was gone; the old lady was nowhere to be found. This unexpected day without morning stiffness plunked me into an alternate reality – did I really used to feel this way? Was I in some twisted version of a Twilight Zone episode? How long would this last? There wasn’t any time to waste. I did a yoga workout, reveling in the light and fluid motion of my joints; I housecleaned, washing walls and floors, vacuuming, sweeping, dancing around like Ginger Rogers with a duster in my hands, feeling exhilarated and…normal? Was this what normal felt like? I could barely recall. What is the definition of normal in a person with RA? Arthritis sufferers have become experts at establishing a new kind of normal (but this subject is reflection for a future post). 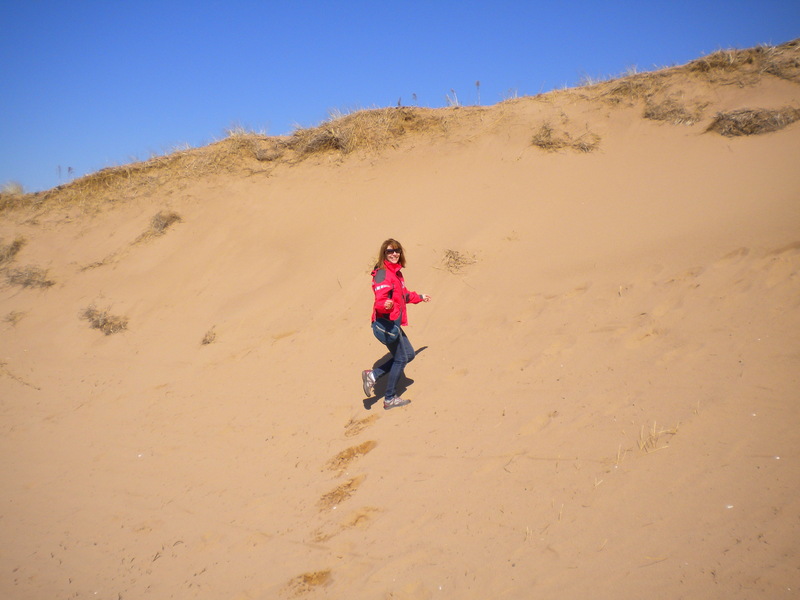 On this day, I could’ve climbed a mountain…well, perhaps that’s a bit too ambitious…how about a sand dune? In the end, I didn’t try to find the reason for this generous bounty; I seized and savoured this rare day in the life of RA. What a wonderful surprise and so glad you were able to take advantage of it. May you have many more! (Maybe this is the start of a trend. These days are few and far between and pop up when we least expect it – my kind of surprise 🙂 Hope all is well with you Carla. How wonderful! I’m behind on my reading, but this made my day! It was a wonderful day. I wish these days for you and everyone with arthritis, although not on such a rare occasion. Hope you are well, Irma.